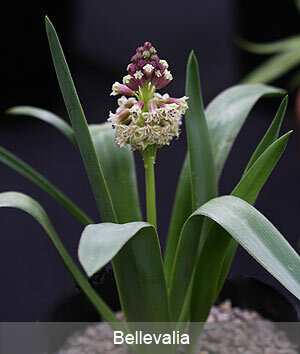 Bellevalia pycnantha is one of the best known of a group of 50 plus species from the Hyacinthaceae family. With so many species it is interestingb that only a handful are grwon in cultivation, the other being interesting, however simply not that colorful. And some species such as Bellevalia paradoxa are so easy to grow they might be called invasive. Originally from Europe the Middle East and across to Crete they are most closely related to Muscari. Bellevalia pycnantha is perhaps the most commonly available species however many others such as Bellevalia romana or 'Roman Hyacinth' and Bellevalia atroviolacea are worthy of a place in the garden. Bellevalia trifoliata is from Eastern Turkey and like all other species prefer a sunny position and a well drained soil. We think we may have Bellevalia trifoliata pictured right.... but not sure . Bellevalia species such as Bellevalia pycnantha, Bellevalia trifoliata and Bellevalia romana are closely related to Muscari and although fairly rare in cultivation make a worthwhile addition to the rock garden. These are from the Mediterranean, so think warm and sunny and good drainage. We think container growing in the UK or perhaps the Rock Garden. Plant in a clump of 4- 5 for a good start, they will 'clump up'. A good deep container and place the bulbs at around 10cm deep. Not real additional care is required, foliage should be left to die back naturally so that maximum nutrition is returned to the bulb. Or maybe try as a single specimen plant, Bellevalia species can be very showy in full flower.